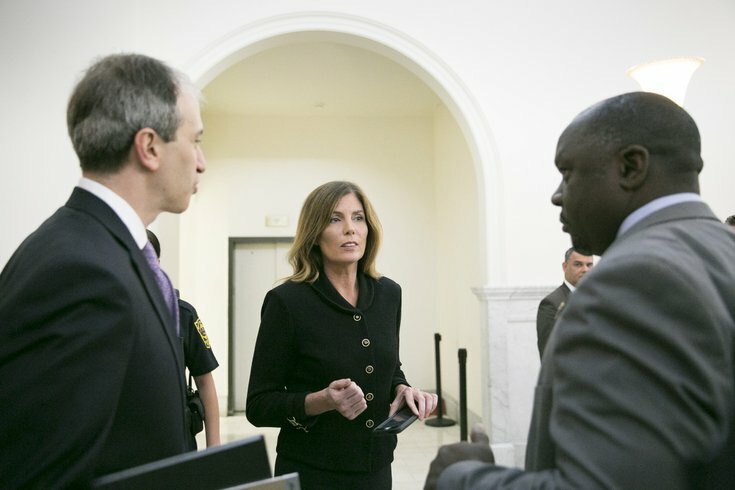 Kathleen Kane exits the courtroom on Monday, Aug. 15, 2016 after jurors were read the charges at the Montgomery County Courthouse, in Norristown, Pa.
Former Attorney General Kathleen Kane was denied her request for an appeal in front of the Pennsylvania Supreme Court on Monday in what marked the end of her effort to avoid a 10- to 23-month jail sentence in Montgomery County. Kane, 52, of Scranton, brought her case to the highest court after the state's Superior Court affirmed her conviction of perjury and leaking grand jury information. In August 2016 the former attorney general was found guilty of two counts of perjury and seven counts of abusing the powers of her office in what started as a feud with a fellow prosecutor. Kane was the first woman and Democrat to be elected Pennsylvania Attorney General and made headlines with her release of "Porngate" — discoveries Kane's office made of sexist, racist, and pornographic emails sent between influential state officials and employees. A handful of high-ranking officials lost their jobs over it. A jury earlier found Kane guilty of releasing confidential jury information to the Philadelphia Daily News related to an investigation run by prosecutor Frank Fina in an act of revenge against him. Many said "Porngate" was merely a distraction from Kane's own legal troubles. According to the Inquirer, Montgomery County District Attorney Kevin Steele "will now move to revoke Kane's bail." Kane will eventually be sent to the Montgomery County jail near Norristown to serve her sentence. It's still unclear if Kane will report directly to jail or if a judge will set a date for her to report to jail, the Inquirer reported.